In 1798, Reverend Thomas Robert Malthus warned the world of impending disaster. He theorized that the human population, growing exponentially, would soon become so immense that the food it required would surpass the food it could grow. But as the Industrial Revolution thrust ahead into the nineteenth century, bringing forth advancements in agricultural production, the world heaved a sigh of relief that Malthus was wrong, and new industrial man scoffed at Malthus’s failure to credit human ingenuity with its due regard. For the moment, we had overcome the Reverend’s gnawing little problem. However, at the time that Malthus was warning us about our food supply, the global population numbered just one billion. Today, as 7.6 billion people are expected to become eight within a decade, the specter of Malthus arises to warn us once again. Food insecurity has crept back into view. What will be our new revolution? This time, with mechanical means of agriculture already highly developed, we turn not to engineers, but to biologists. And just as the radical leaps in industrial technology met with its Luddites, so the modern biological age of agriculture contends with its own neigh-sayers. But we ought not be hasty to dismiss their doubt as alarmist: the modern answer to Malthus involves supplanting the food supply with genetically-modified organisms, or GMOs. In other words, today’s Luddites aren’t simply disaffected workers but an entire human species concerned with the long-term health problems arising out of genetic tooling. Many worry that the very miracle products meant to save us from starvation may sooner impair our global health and that of posterity. One case of genetic food engineering still on trial by global opinion is the recent innovation known as “golden rice.” Golden rice is a genetically modified rice grain that has been biologically altered to include vitamin-A, a vitamin necessary to human survival and eyesight. The creation is dubbed “golden” because of the hue it takes on when the vitamin-A is added. Vitamin-A is the same vitamin that gives carrots and pumpkins their bright orange color, thus turning this new rice from white to gold. The benefit of golden rice, however, does not come from its lofty name or brilliant sheen but from its vital global health potentiality. The World Health Organization (WHO) has persistently warned of the deleterious effects of vitamin-A deficiency (VAD) in many regions of the world. Specifically, the WHO reports that VAD is the single most important cause of childhood blindness in developing countries” and that VAD contributes significantly “to morbidity and mortality from common childhood infections.” The United Nations International Childhood Emergency Fund (UNICEF) warns that VAD is the “leading cause of preventable childhood blindness and increases the risk of death from common childhood illnesses.” In the regions of the world where foods containing the vitamin-A are economically or agriculturally inaccessible, VAD poses a major health threat. The condition overwhelmingly affects poorer communities, particularly in the Pacific, Southeast Asian, and Sub-Saharan African regions. The WHO has officially named VAD a global public health concern on account of VAD’s vast reach and pervasiveness. Approximately one third of children between the ages of 6 months and 6 years suffer from VAD, and an estimated 250 million children suffer from VAD, with blindness occurring in 250,000 to 500,000 children each year. Of those children affected with blindness, half of them die within a year of going blind. All this despite VAD being highly preventable. The initial response to VAD, carried out by a number of health organizations around the world since the 1990s, was vitamin-A supplements. While this remedy helped reduce some incidence of death, it failed to reach much of the affected populations. Enter golden rice. Rice itself is the crucial source of energy for a significant portion of the world population. Over 3.5 billion people depend on rice for at least 20% of their caloric intake. And while rice is third in global grain production after corn and wheat, it is cheaper and therefore the more prolific grain among economically poor regions of the world. Crucial to golden rice’s efficiency as a solution to VAD is rice’s role as a staple grain in developing Asian countries and Sub-Saharan Africa, the same regions where VAD occurs in high numbers. Thus, golden rice presents itself as an elegant solution to the VAD problem. In theory, if golden rice can be grown in place of regular rice in these Asian and African regions, VAD may be treated and prevented more effectively and economically than with the traditional vitamin-A supplement approach put forth by UNICEF and the WHO. However, simply introducing vitamin-A into the rice of VAD regions is not as easy in practice as in principle. As with all GMO foodstuffs, health questions arise. The countries targeted by golden rice have serious concerns about unintended side effects from consuming biologically-engineered rice. As golden rice development continues, these countries will push for stronger evidence that the rice is safe to eat before allowing mass production for their people. Already there has been serious resistance to the product among organizations such as Greenpeace and by the populations of some VAD countries. In one instance in 2013, hundreds of protesters in the Philippines uprooted golden rice crops that had been planted in the country for field testing, displaying the yet undetermined fate of this health innovation. As of today, testing and development of golden rice continues, and mass appeal for the miracle grain is left up in the air. 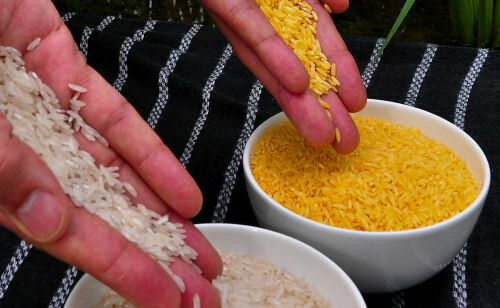 Developers of golden rice hope their invention can step out from the shadow of more contentious GMO products, but its fate is left to the tension of science, fact, and global caution. Today, the question of our modern food insecurity problem is yet left undetermined. The international controversy surrounding the pros and cons of genetically modified foods will continue to pit the celebrators of scientific discovery against the pragmatic representatives of regional health concerns. Meanwhile the Malthusian clock is whirring in the background: one in nine people on earth suffers from chronic undernourishment, according to the United Nations Food and Agriculture Organization. Many are optimistic that our modern answers to the global heath and scarcity issues brought by population growth, golden rice among them, will unravel a new age of food security. Others stay weary that in the end, we may be left with the bitter taste of scientific heroism gone wrong. Nonetheless, it is crucial that the debate remain focused, not on unsupported optimism or irrational fears, but on the facts of the case.